The aim of the study was to evaluate established risk factors and define new inflammation-associated factors associated with postoperative ventriculoperitoneal shunt placement. 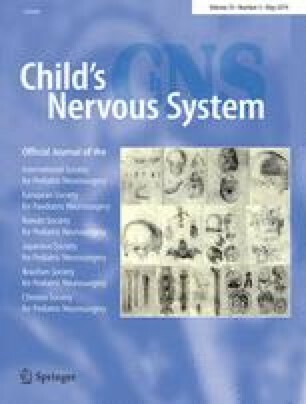 The electronic medical records of children who underwent surgery for a tumor in the posterior fossa between January 2009 and January 2018 were retrospectively analyzed. Factors evaluated include age, clinical symptoms, tumor type, extent of surgical tumor resection, treatment with EVD and/or ETV, radiological findings, postoperative serum CRP, and leucocyte levels. Tumor tissue was stained immunohistochemically with antibodies against CD3, and leucocyte counts were performed. Patients with pre- or postoperative signs of infection or confirmation of a concurrent infection were excluded from some analyses. Seventy patients ages 0.4–20.8 years (median, 8.2) were included. Forty-five of 70 (65.3%) presented postoperative radiological signs of hydrocephalus. Fifteen of 70 (21.4%) patients required shunt placement postoperatively. Shunt placement was significantly associated with age < 3 years at diagnosis (p = 0.013), perioperative EVD placement (p < 0.001), signs of hydrocephalus in postoperative imaging (p = 0.047), a frontooccipital horn ratio (FOHR) > 0.46 within the first 72 h postoperatively (p < 0.001), and the presence of intraventricular blood postoperatively (p = 0.007). Six patients who underwent shunting had serum CRP levels > 40 mg/l (p = 0.030) within the first 48 h postoperatively. Tumor type or extent of resection did not correlate with shunt placement. Several established and new factors associated with shunt placement after posterior fossa tumor surgery could be identified. Additional studies are needed to explore the aseptic inflammation pathways involved with increased CRP levels and shunt placement. Portions of this project were presented in poster form at the 45th annual meeting of the ISPN in Denver, Colorado, USA, in 2017.